Chaos War: Thor #1 will be out in November. If the good time I'm having writing this story translates to the printed page, it should be a fun—and suitably cosmic!—read. 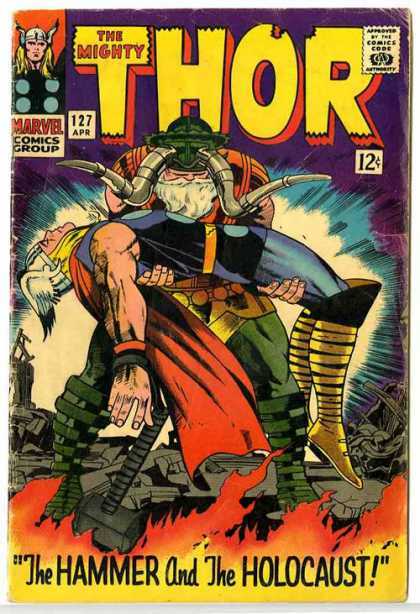 I really need to read those Lee/Kirby Thor stories! Maybe when I do I'll post on my blog. What's your opinion of Walt Simonson's run? I have incredible respect for Walt -- he's a massive talent -- but I wasn't a regular THOR reader back when he was writing the book. (Truth is, I don't think I ever followed the book with much regularity after Stan left...and that's a long time ago!) That said, I do remember that my old pal Sal Buscema was doing some extraordinary work in collaboration with Walt; and I know that most folks who followed Walt's version of the thunder god, and there were many of them!, consider it one of the high-water marks of the series. Yes, David, you really should read those Lee-Kirby stories. If you're looking for twelve absolutely perfect issues, start with JOURNEY INTO MYSTERY #124 (the introduction of the Marvel version of Hercules) and then prepare to be mind-blown by Greek gods, alien colonizers, Ego the Living Planet and the High Evolutionary -- all climaxing with Jane Foster's visit to Asgard in JIM #136. There were amazing issues before and after, but this particular run of stories is my all-time favorite. What's even more extraordinary is that Stan and Jack were simultaneously crafting the greatest FANTASTIC FOUR stories ever told, creating -- in these two series -- comic book epics utterly unlike any that had come before. When those two guys were in the zone, there was nobody better. Will do, JMD! I'll check back in when I'm finished. Thanks for the recommendations. Here's a thought: Giffen/Dematteis Warriors Three (think how they'd look under the pencil of Maguire; I'm still basking in joy from re-reading JLI)! Looking forward to seeing your take on Thor. My favorite aspects of your writing are the introspection, sentiment and silliness. Underneath all of these is a sense of wonder and grandeur, which I expect will be brought more to the surface with this project. I'm sure you'll surprise me as well! Warriors Three with Giffen and Maguire is a fun idea. Maybe one day: right now Keith's under exclusive contract at DC. If you're enjoying a re-read of JLI, I hope you're getting a kick out of the current BOOSTER GOLD issues featuring Booster, Beetle, Mr. Miracle and Big Barda. Next month, Ted gets turned into a chipmunk. No kidding! I've always liked the Thor character, but have had mixed reactions to the Thor comics I've read over the last couple of decades. But I am thrilled to hear you will be trying your hand on the character, I will definitely be picking this series up! exciting news! and that Kirby cover is pure magic. Kirby produced some of the greatest covers of the 60's, Mike. "Pure magic" indeed. I know that there was a period when Marie Severin would actually do the basic layouts for the covers and then Kirby would bring them to life in his unique and powerful way, but I don't know what year that started. I'd love to know how that all worked. If anyone out there has info about the Severin-Kirby connection, please post and let us know.